The surfs so cold on Vancouver Island it causes brain freeze. Think surfing and you probably think bronzed bodies, frothing waves and warm sun. Tofino, British Columbia has the waves, but the sun hides behind the clouds that make this a rainforest, and bodies are hidden under layers of neoprene. “In winter I wear a thick wetsuit, hoodie, boots and gloves but when I go under a wave I still get a brain freeze, ” explained surfer Sarah Smith, her delicate features belying the inner strength needed to ride a board into 45°Fahrenheit waters. “In summer I still wear the same gear but my head doesn’t hurt from the cold.” Just watching surfers bob among the wake wash on Cox Bay was giving me a chill as rain dripped from the sky and down my back. This place gets 130 inches of rain a year and is a nature lover’s dream. 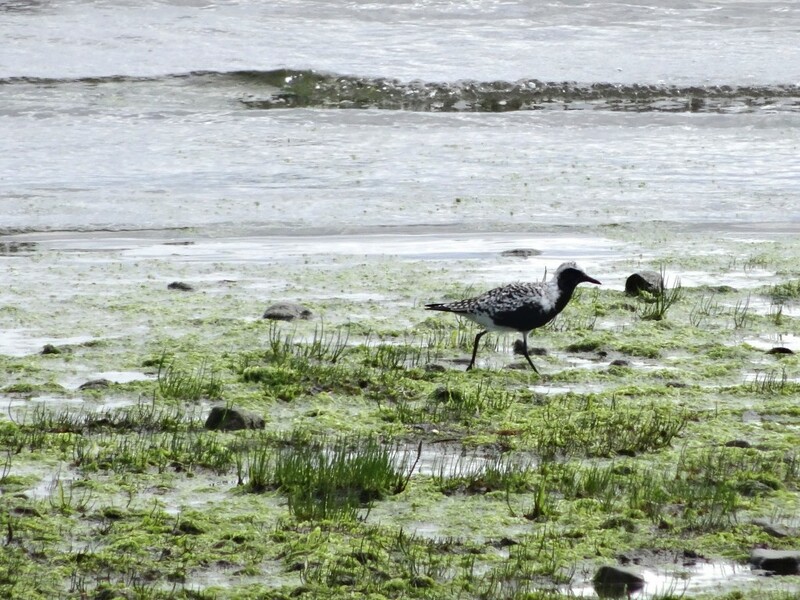 I’d come looking for thousands of shorebirds that stop en-route to Alaska and had instead become transfixed by surfers traveling by bicycle, their surfboards strapped to metal sidecars. Realizing I could gawk from indoors where I didn’t need my long underwear, I headed to the Great Room at Long Beach Lodge Resort where bar manager Andre McGillivray served up gin infused with hand-foraged botanicals. Rumored to taste like the nearby forest I was eager to try this craft gin. McGillivray layered gin, lemon juice, demerera sugar and meringue into a creamsicle-colored cocktail that provided a pop of color against the grey sky. McGillivray pulled a lighter from his pocket and set angostura bitters on the drink ablaze. The flames danced above the glass and faded quickly like some of the surf attempts outside the window. I slid the frothy liquid down my throat. It did taste like the forest or perhaps like the fresh air whipping over the ocean. 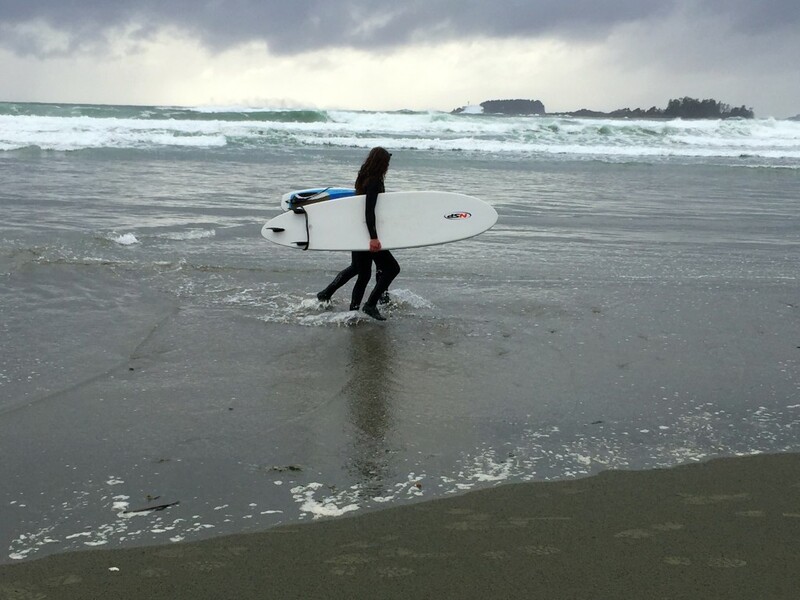 Tofino may serve up the coldest surf on the west coast but its methods for warming up are a no-brainer. Have you ever tried flaming gin? Click to Tweet. 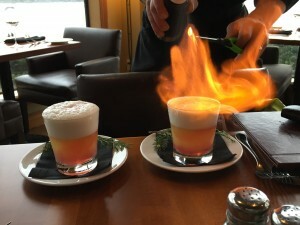 My friend, @Reinventure, recently took a trip to Tofino, BC & enjoyed this flaming beverage: Click to Tweet. Long Beach Lodge Resort’s gin and surf offerings are next to none: Click to Tweet. 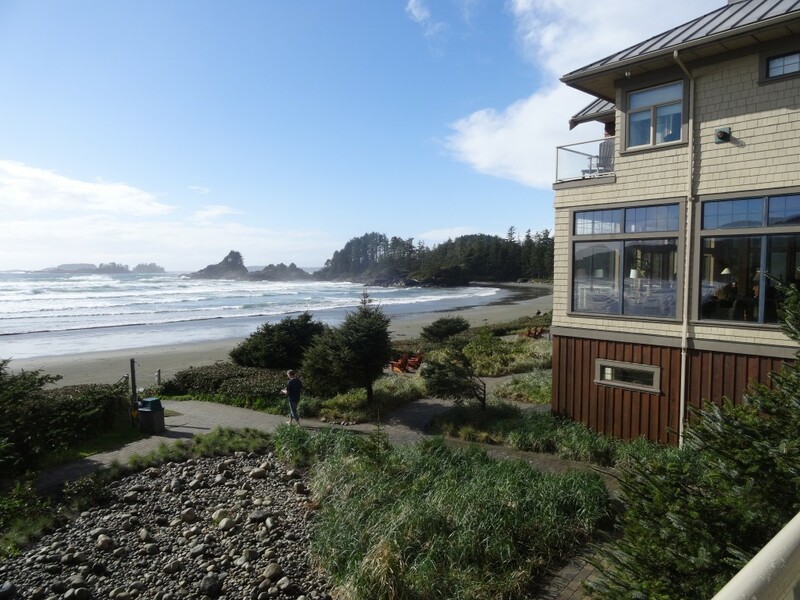 Drive to the western edge of Vancouver Island and you’ll find the surf-mad village of Tofino. Toque-wearing surfers cycle by, their surfboards clipped to a small trailer, the money saved on petrol buying them more time in this rainforest paradise. Motorhomes that were popular in the 70’s – and worn-out in the 90’s – limp along highway 4 as surfers coax more life from them; neoprene wetsuits dry on car mirrors as shaggy haired guys heat soup and discuss surf conditions. Weaving around the world’s hardiest surfers – waters are bone-chilling cold even in July – are other travelers who stroll the Pacific Rim National Park beaches. Some of them chow down on crab and mac cheese at Long Beach Lodge Resort, or hop a boat for a tour of Clayoquot Sound. Others are pecking the sand for their lunch, their trip to town accomplished by wing flapping. These are the shorebirds that fly thousands of kilometers from South and Central America to their breeding grounds in the north. They are the tourists not counted by visitor bureaus but Tofino is very popular with traveling birds. 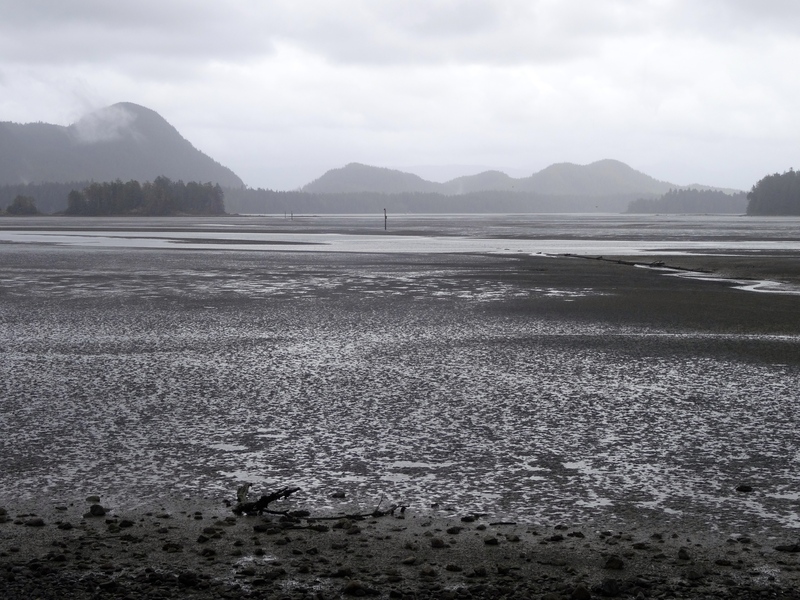 Behind the hotels and spas that pamper human visitors are the Tofino mudflats, gooey coastal wetlands that at low-tide serve up a nutrient buffet for sandpipers, whimbrels, and plovers. Shorebirds fly long distances, sometimes half-asleep with one eye open and one eye closed (similar to a red-eye economy flight for humans). In addition to being some of the world’s longest migrators shorebirds are also some of its biggest eaters. They consume about a third of their body weight each day as they prepare for migration and eat so much they poop every two minutes! The town celebrates these understated tourists by holding the Tofino Shorebird Festival each year. From April 29- May 1, 2016 you can take a kayak tour with Murray, learn to photograph birds, hop on the M.V. Lady Selkirk to look for Tufted Puffins and Rhinoceros Auklet, or if you’re really adventurous, journey to the offshore Continental shelf break to see pelagic birds. Look for shorebirds at the end of Sharp Road (the turn-off is by the Dolphin Motel). Best viewing is mid-tide rising.